(CNS): The independent member for North Side has begun his preparations on a private member's bill that he says he will bring to the Legislative Assembly before the end of the year if government continues on its U-turn over introducing 'one man, one vote' (OMOV) in single member constituencies (SMCs). Ezzard Miller said he has had preliminary discussions with the attorney general, and although he and East End member Arden McLean, who brought the private member's motion, which was narrowly rejected, appreciate the numbers, they remained hopeful that some members of the government benches will remember their campaign promises and help its passage. As is allowed under the LA’s standing orders, although they are not part of government, Miller and McLean intend to draw up the full necessary legislation with the help of government legal drafters, which they will need to pay for themselves, to change the elections law and introduce SMCs with OMOV, as per the parameters of the July 2012 referendum, and then put it to the vote. Miller told CNS this week that he was bitterly disappointed with the government’s reaction to McLean’s motion, which was debated in the Legislative Assembly last month and saw the premier reveal that government would be pursuing a hybrid system of 'at large' candidates and single member constituencies, giving voters not one vote in SMCs but four or possibly five votes in combination of SMCs and a national slate. Miller said that many people had told them that they were shocked by the premier’s decision to defend his post and keep his government in office rather that fulfill his campaign promise. He said there could be no question that one of the issues on which the current government was elected was OMOV in SMCs. The turnaround was damaging, he said, and had led to mistrust in the community and the government had lost considerable political capital, especially coming in the wake of government’s regression on the matter of a minimum wage as well. He said that integrity in government was not “merely the absence of stealing money” but also keeping one's word. “We must see this newfangled idea of 'at large' candidates for what it really is – to increase representation in government from George Town and another way for politicians to use each other’s coattails to get elected,” the North Side representative said. Committed to drawing up the bill, despite the prospect of defeat, Miller said the public could help by contacting their representatives and demanding that they fulfill their election promises on the issue. He said this might persuade enough of the government benches that this is the right thing to do, regardless of their party or government loyalties. Miller, who said he has been campaigning for OMOV, has raised considerable concerns about the governments U-turn being merely a ploy to delay the implementation of a new voting system by coming up with distraction that will drag the process out for so long that the 2017 election will be fought on the same grounds as that of 2013. During his contribution to the debate he had pointed out that he had supported SMCs since the 1970s, when he began the fight as a high school student. He said the only reason Cayman still does not have OMOV in SMCs is because of politicians. For fifty years, Miller stated, they had continued to do what was best for politicians and not what is best for the people. Puzzled by Alden McLaughlin’s declarations that the C4C members in his government, who werein a minority, had threatened to being down the Progressives administration, he pointed out that even if they had crossed the floor the government would win a no confidence motion as it was still a majority. Miller promised to do everything he could to campaign against 'at large' candidates as he said they were unfair and just another way to tip the balance in favour of the capital influencing government. He said multiple voting distorted equality, especially when people could manipulate their vote. One vote cannot be manipulated; it can be cast for one candidate or it can be withheld, he pointed out. Although Miller does not subscribe to any of the ills that government is now rolling out about SMCs, he said that even if they existed, reducing the constituencies from 18 to 15 would hardly make much difference. He also criticised government for not admitting which demographic group of Caymanians it was concerned about when McLaughlin had raised the issue of weird results in certain communities in George Town. Miller said the only people who can vote are Caymanian and status holders can’t run for office. If people picked second generation Caymanians from their own ethnic group to represent them, then that was their democratic right, he said. If a candidate was a Caymanian, even if his parents were born in the Philippines, Jamaica or Canada, he had a right to run for office and the people in his constituencies had a right to vote or not vote for him regardless of their own ethnicity. Such comments from government as a reason to try and manipulate the electoral system were very dangerous, Miller warned, as he pointed to the Bill of Rights. Attacking the government’s complaints of parties or candidates dominating small constituencies, he pointed to Arden McLean, who ran in a party twice and won and then as an independent and won. People simply don’t get elected if they do not represent the interests of the people of their constituencies, he said. (CNS): Immigration officials have now confirmed that nine Cuban migrants were transported to Grand Cayman from Cayman Brac yesterday and they are currently being processed at the Immigration Detention Centre (IDC). The nine men, aged between 27 and 43, including two refugees who have landed in Cayman before, were taken into custody on the Sister Island and detained at the Aston Rutty Centre after they were found walking on the main road late Monday night by residents. The men, who were from Camaquey province, had landed on the south side of the Brac as a result of problems with their 12-foot aluminium boat, which was leaking. They had left Cuba on 7 March and were heading for Honduras. The group revealed to local authorities that their single engine had run for about a day and then shut down but they continued the journey to Cayman Brac under sail. This is the second group of Cubans to land in Cayman having failed in their efforts to reach their destinations. On Ash Wednesday last week a cruise ship rescued of 24 Cuban migrants at sea when their boat was also taking in water. Both groups are now being processed, officials said, “in keeping with established protocols”, as government continues with the policy of automatic repatriation. Three of the Cuban men escaped from the IDC yesterday afternoon but they were apprehended last night by enforcement officers. (CNS): The premier’s trip to London earlier this year to appear on the BBC’s leading news interview programme, to speak at the Chatham House conference and to meet FCO officials cost the public purse $17,437.70. Alden McLaughlin was joined on the week-long trip by Cabinet Secretary Samuel Rose and his senior political advisor, Roy Tatum. Officials from the premier’s office revealed Wednesday that the airfares totalled $8,048.59, the per diem allowances came to $3,300 and hotel expenses were $6,089.11. 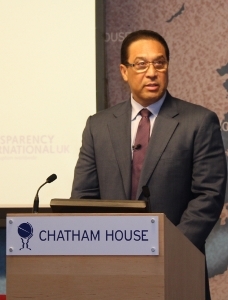 “This Chatham House conference examined the prospects for concerted action to tackle global corruption and considered the role of governments and businesses in achieving lasting impact,” the premier’s press secretary stated in a release. “Participants and speakers critically assessed current and emerging international efforts and considered their consequences for future business practice and governance. “On HardTalk, the Hon. Premier shared Cayman’s positive story of being a successful Overseas Territory by answering hard hitting questions from presenter Stephen Sackur,” she added. Although there had been concerns that Sackur would use the opportunity to undermine Cayman, the premier came away without too many licks. While the appearance may have done little to change opinions on the global stage about offshore tax avoidance, fears that the appearance could make matters worse were unrealized and the premier was able to demonstrate that Cayman is willing to answer questions about the offshore sector after many years of turning away from the international media arena. (CNS): Two Malaysian nationals who between them stole and tried to steal more than US$200,000 worth of jewellery from stores in Grand Cayman with cloned credit cards were both sentenced to 16 months in jail on Tuesday. The court heard that the men arrived in Cayman via Dubai with more than 100 cloned credit cards in their names, which they used in several stores to buy or try to buy expensive jewels and watches. 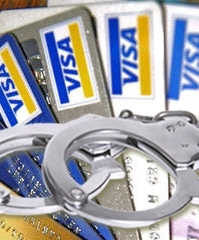 However, the con men, allegedly sent here by Malaysian loan sharks, raised suspicions, and having told store staff where they were staying when they made purchases with their fraudulent cards, the police were easily able to locate and arrest the men. During Tuesday’s sentencing hearing, crown counsel Toyin Salako related the details of the case to visiting Grand Court judge, Justice Malcolm Swift. She said that Hew Senn Wann (51) pleaded guilty to obtaining a money transfer by deception of US$74,161 and attempting to obtain a money transfer of US$36,000. During his efforts to buy high value goods Wann had attempted to use more than 20 different cards before the men were caught. Thanabalan Manogar (31) pleaded guilty to one count of obtaining a money transfer by deception for the sum of US$86,623 and two attempts at US$39,610 using about four different cards. They came to Cayman on the 1 and 2 of October 2013 respectively on the instructions, they claimed, of a man called ‘Tom’ in Malaysia, who appears to have been a credit card cloner. The men said they were both indebted to this loan shark and were struggling to pay him back. Following threats to their families, the men had, according to their defence attorneys, been told if they did what was described as a “job” in Grand Cayman their debts would be erased. Arriving here with more than 50 cloned cards, both men proceeded to try and purchase expensive watches and jewellery in two of Kirks down town jewellery stores, as well as the Magnum Jewellery store at the Marriott Hotel. They also paid for their stays at the Marriott and the Comfort Suites with the cloned cards. Even though Wann had presented some 18 different cards during one trip to Kirks jewellery store in Cardinal Avenue, it was not until Manogar raised the suspicions of staff at the Bay Shore Mall store that the men were apprehended. The sales assistant there had taken the details of the men and where they were staying and passed the information to the police. Caught with more than 100 cloned cards between them, as well as the fraudulently obtained Rolex and other designer watches, the men admitted coming to Cayman on the instructions of their Malaysian handlers when they were arrested. A series of text messages on the men’s phones indicated that they were indeed following step by step instructions from someone named Tom. In mitigation, defence counsel for Wann, John Furniss, and Prathna Bodden for Manogar, who was a Tamil speaker and assisted by an interpreter, both pointed out that their clients had no previous convictions, and although they were part of a plan to steal high value goods, the pair were not the planners and their only gain from the goods they were trying to steal would have been to have their debts cleared. Prathna Bodden also told the court that the delay in her client’s guilty plea was as a result, once again, of major disclosure problems from the crown and Financial Crimes Unit, which she said had not produced any evidence at all against her client, who does not speak English, despite various court orders, until she filed for a dismissal hearing. She said that Manogar, who was a lorry driver in Malaysia and not very well educated, had no idea that he was being sent to Grand Cayman to use cloned cards until he was aboard the aircraft and had open a package as instructed by his handlers, who gave it to him to find the multiple credit cards. The judge said that he took fully into account that the men had no previous convictions and gave full weight to their personal family circumstances. 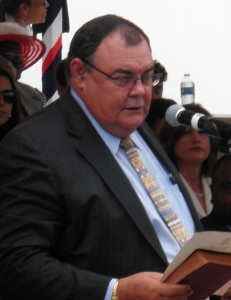 Justice Swift said he was satisfied that the crime was deliberately targeted at this jurisdiction because, like other islands in the region, Cayman is vulnerable to this type of offending as the stores here are familiar with foreign tourists purchasing high value goods with foreign credit cards and familiar with occasions when cards are not cleared for various legitimate reasons. “I accept that you were instruments of the system,” the judge told the men as they stood in the dock, but he added that they were willing participants and, despite their claims regarding the loans, he said he believed they were motivated by greed. With no local cases to compare sentences, the judge used the UK sentencing guidelines and started with a 2 year sentence for both men on both counts to run concurrently. However, given their guilty pleas, he said they would receive a one third discount, reducing the time to 16 months with time served since 3 October, when they were arrested, taken into consideration. A third Malaysian national remains on remand after pleading guilty last Friday to a similar offence. Teck Kuan is expected to be sentenced next month. (CNS): The Cayman Islands Athletic Association is hosting the annual Truman Bodden Track Meet at the Truman Bodden Sports Complex on Friday, March 14 at 6:00pm and on Saturday, March 15 at 4:00pam. The Meet, which will be used as a qualifier for a number of international games, is sponsored by noted Attorney-at-Law, Truman Bodden. 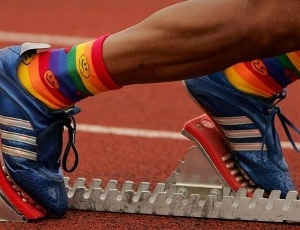 The Association expects that all athletes, both senior and junior will be out in full force vying for a chance to qualify for CARIFTA Games, CAC Jr, C.U.T, NACAC U23 among others. “We are also expecting that a large turnout of local athletes will be competing at this meet to test their athletic skills on the newly renovated MONDO track especially with the Inter-Primary and Inter-Secondary Track & Field Championships looming,” organisers stated in a release. ciaaa.meetscommittee@gmail.com. Registration closes on Wednesday, March 12. The athletic event been staged for over 20 years now and is one of the major Track Meets on the Association’s calendar. Bodden has been an enthusiastic supporter of track and field in the Cayman Islands in excess of two decades and has assisted in obtaining corporate sponsorship from other local business houses. The public is urged to come out and support homegrown athletes who are battling for a chance to qualify for a spot on Team Cayman travelling to compete at the 2014 CARIFTA Games in Martinique and for other upcoming Regional/International Meets.